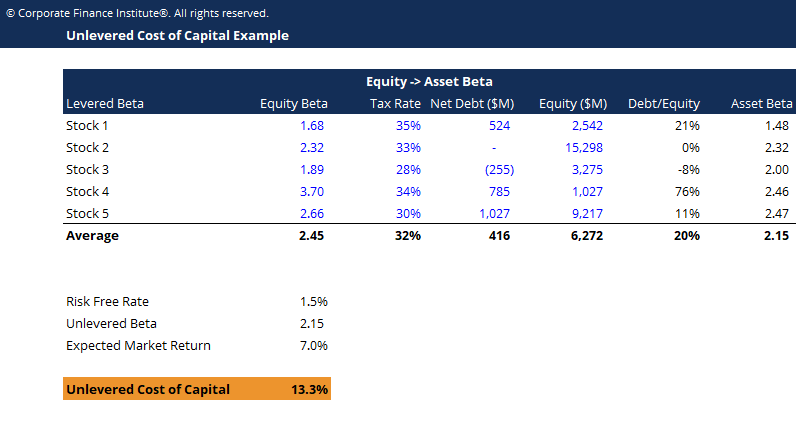 This unlevered cost of capital template shows you how to compute the unlevered cost of capital given the risk free rate, unlevered beta and expected market return. The unlevered cost of capital is the implied rate of return a company expects to earn on its assets, without the effect of debt. A company that wants to undertake a project will have to allocate capital or money for it. Theoretically, the capital could be generated either through debt or through equity. The weighted average cost of capital (WACC)WACCWACC is a firm’s Weighted Average Cost of Capital and represents its blended cost of capital including equity and debt. The WACC formula is = (E/V x Re) + ((D/V x Rd) x (1-T)). This guide will provide an overview of what it is, why its used, how to calculate it, and also provides a downloadable WACC calculator assumes the company’s current capital structure is used for the analysis, while the unlevered cost of capital assumes the company is 100% equity financed. A hypothetical calculation is performed to determine the required rate of return on all-equity capital. This numerical figure or capital is the equity returns an investor expects the company to generate to justify the investment, given its risk profile. In reality, however, this number is just an assumption. Real figures cannot be given.